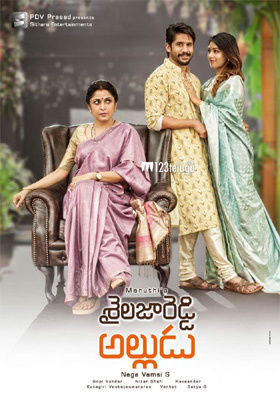 Naga Chaitanya’s ongoing romantic family entertainer, Sailaja Reddy Alludu, is nearing completion. The film has senior heroine Ramya Krishna playing Chay’s mother-in-law’s role. Meanwhile, the latest update is that the makers are planning to unveil the film’s first look teaser very soon. Confirming the news, SRA’s director Maruthi wrote on his Twitter handle: ” nka Waiting ki terapadindi #ShailajaReddyAlludu Teaser announcement very soon :)” Needless to say, all eyes are on the teaser, as fans are eagerly waiting to see how Maruthi is going to present Chay. Young starlet Anu Emmanuel is the leading lady in Sailaja Reddy Alludu. The film is produced by Suryadevara Nagavamsi under Sithara Entertainments banner. Gopi Sundar composes the music.